Christmas Fun with the kids! Good morning everyone! I am so excited to share today’s project with you! The design team members from May Arts ribbon have been sharing some kid’s crafts with you, and today, I get to share the fun I had with my two girls! One of the traditions we have in our family is to give a Christmas ornament to each family member. I thought it would be great to mix together some of the things that the three crafty girls in my family love the most into a pretty, colourful and fun ornament. These are really easy to make, even for little hands. My youngest who is three loves pompoms (but not the glittery ones because they are not soft), while my 5 year old is all about the glitter! I, on the other hand, am all about the ribbon, and if you’ve ever looked around here at ScrappyCanuck Studios, you will know that May Arts 3/4″ Chevron twill (382-34) is my FAVOURITE!!!! We started by adding the pompoms – even the littlest hands got the hang of it really quickly. There are five more ladies who have fun projects to share with you today, and make sure you stop by and comment for your chance to win. As always, our generous Ribbon Lady Bethney has a giveaway for you, and you do not want to miss your chance to win! 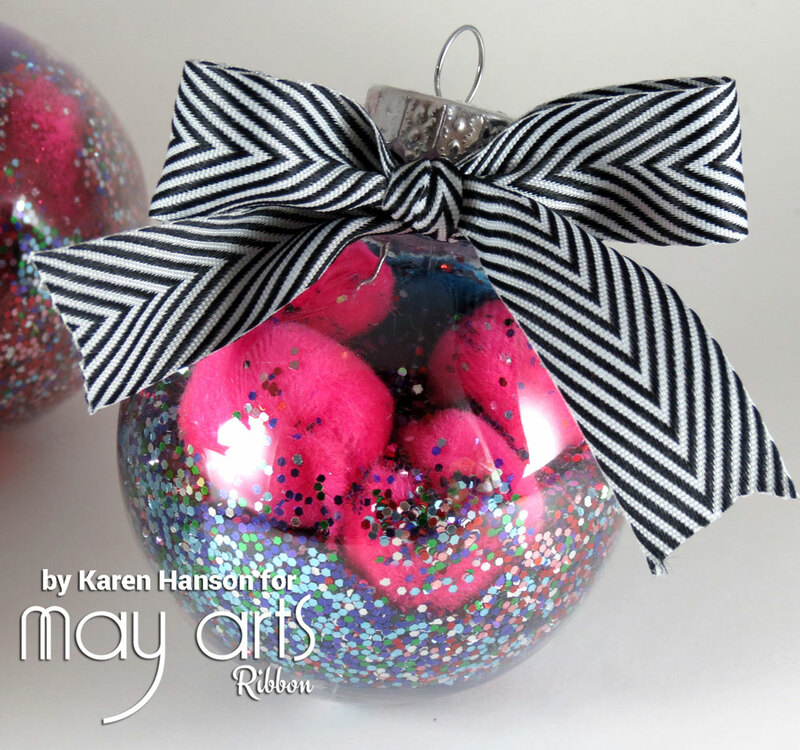 This entry was posted in May Arts Ribbon, Toddler craft and tagged Christmas, kids, May Arts, ornament, toddler by Scrappy Canuck. Bookmark the permalink. These are so cute with the pom poms. These are so cool!! My grandsons are going to love creating these with me! Thanks for the inspiration! The pom-pom’s and glitter are a fun and festive idea! Thanks for sharing! I LOVE seeing families CREATE TOGETHER – they are THE BEST OF TIMES!!! THANK YOU for sharing your CREATIVE INSPIRATION and giving me ANOTHER reason to get out my glitter and have some Crafty Christmas time with my nieces & nephews!!! I couldn’t help but giggle all the way through your post. Not sure if it was because your kiddos are so cute, or the ornaments, or all the fun you allowed them to have, but I wish i could have been in the middle of all the fun!! I miss my boys being little. They grow so fast. It’s great to see you letting yours have so much fun and nourishing their artsy side of the brain 🙂 Darling project, too! I think the pompom look like sugary gumdrops! Nice project, looks like a lot of fun too. TFs.